Today's post is brought to you by the color green and the color white. Both my high school and college colors were green and white, so I've always had this little sentimental attachment to them. But it seems while thinking of house decorating, I've got green and white on the brain! Today's white portion is what I teased in my last post: the now-white tables we'll use in our new house! We spent Saturday and Sunday prepping and painting these tables, and the results really turned out great. I can't wait to see them all set up when we move in! Eric found two tables at a thrift store a few years ago and currently one is serving as our record-player holder, and the other holds my sewing machine. They're good, sturdy tables, and I love the look of their unique scalloping and detailing along the legs and top of the table. To minimize any chance of bumps from dirt or debris on the table, we rubbed down the surface with a damp towel and let it dry. We were a little lazy this time around and skipped the sanding, which it turned out we didn't really need to do anyway - we went straight to the priming! 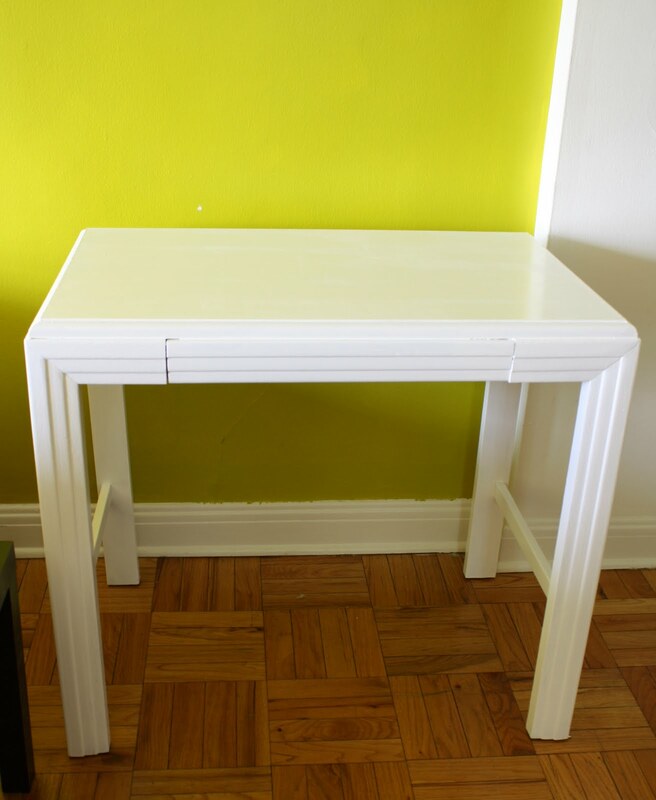 We were lucky with the tables, as the paint really stuck well, and the legs only needed two coats of paint. We finished the top with three coats, since it would be the most-visible area of the table. I think they look great! They'll bring such a cohesive look to the living room/"French" room. And the best part, besides being ultra thrifty, is that we can proudly say we did the work ourselves! So the white paint is done, for now. With those two tables and the chair, we've still got about 1/4 can of white paint left - talk about stretching our dollar! We're hoping the tables don't get nicked up in the move, but in case they do, we'll have the perfect amount of touch-up paint. Today's green portion of this post actually doesn't involve paint (though don't be surprised if you see a green-paint post in the near future....), but the snack that fueled these marathon paint sessions over the weekend. If you follow any food blogs, you've been hearing a lot about kale lately. It seems to be the posh leafy green these days - if leafy greens could be considered posh. And to tell you the truth, I just don't get it. I've tried kale inn salads and I just find it too tough with not enough flavor. I've been skeptical of all this kale hype, but when Eric brought some home suggesting we try it, I decided to give it one last chance - in chip form. A drizzle of olive oil, a sprinkle of sea salt and a trip to the oven later, I was in love. Kale chips are AWESOME. They honestly taste just like potato chips, but are about 1000 times better for you. And they couldn't be easier to whip up. First, wash your bunch of kale. Next, arrange the kale pieces on a cookie sheet lined with parchment paper. Finally, pop those puppies in the oven for about 10 minutes, or until crispy. Add them as a side, them wolf them all down, completely forgetting there's anything else on your plate. And I'm not just saying they're delicious just because they're a healthy alternative to chips - I may even prefer them to chips. They're also boyfriend-approved; Eric said he could see himself happily munching on kale chips during a game and not even miss chips and dip. Seriously, try kale chips. Make them right now - they're too easy not to. I have heard about kale chips and couldn't figure out how ??? Thanks for the great step by step.. I love kale and will definetely give this a try. Looks easy enough.. thanks. I'm your newest follower. I would love it if you checked out my blog and followed me back. I blog vegetarian, gluten free and healthy eating recipes.